Send this voucher to your near and dear ones to enable them to purchase things of their choice. These coupons can be used over a period of time and hence offers great flexibility. The store retails in Groceries, music, stationery items, computer games, crockery, greeting cards, magazines, toys and much more. 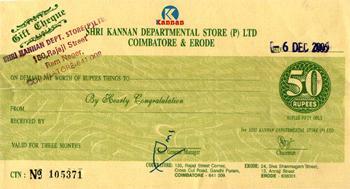 Kannan Departmental Stores have outlets at Coimbatore and Erode. These Gift Vouchers can be used at any of these two outlets. Send this voucher to your near and dear ones to enable them to purchase things of their choice. These coupons can be used over a period of time and hence offers great flexibility. The store retails in Groceries, stationery items, crockery, toys and much more. 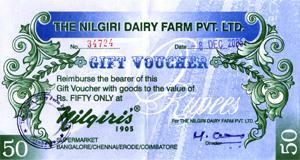 Nilgiris Super Market have outlets at Coimbatore, Erode, Chennai and Bangalore. These Gift Vouchers can be used at any of these four outlets.